The boutique cruise ship MV Fantasea Ammari has added a new dimension to Brisbane getaways with a series of weekend itineraries highlighted by a three day Easter Escape. The 60 metre, four deck cruising catamaran accommodates 64 passengers in 32 spacious, luxuriously equipped, air conditioned cabins complete with ensuite bathrooms and plasma television screens and has previously cruised the Mediterranean and the Whitsundays. Now based in Brisbane, the ship will cruise Moreton Bay taking in Tangolooma, Stradbroke and the wrecks with itineraries that include a three day Easter Escape from April 10-12, Mother’s Day cruise options (May 2-3), a cruise over the Queen’s Birthday weekend (June 6-8) and Father’s Day weekend (September 5-6). The ship will be available for corporate charters and events and be a familiar sight at special events in the South East. Ammari will cruise to Townsville for the V8 Supercars race in July, to Sydney Harbour for Christmas, the Boxing Day start of the Sydney to Hobart Yacht Race and New Year’s Eve cruises before returning to the Gold Coast for the Magic Millions. MV Fantasea Ammari CEO Angus Campbell said that the presence of the ship in Brisbane would enable people to enjoy and appreciate the beauty of Moreton Bay and surrounding areas as never before. Softies eh? I get the impression some folk still think adventure cruising is just another way of sipping cocktails around the pool bar – at a premium price. Those of you with a taste for the harder edge can do stuff to really get their attention at Silvia’s next dinner party. Some of the cruise companies will offer a range of activities with gold medal bragging rights like scuba diving, mountaineering, trekking, ice swimming and sea kayaking. The easiest wet one is Pendulum Cove on Deception Island where a volcanic thermal vent keeps a small patch of water warm, but for some that’s cheating. Orion Expedition passengers do the “polar plunge”, an Antarctic Circle tradition in the sub-zero waters of the deep south while drinking a toast to King Neptune. Brrr! Shore excursions like Greg Mortimer’s Shackleton Crossing is a true heroic trek, following the great explorer’s route across South Georgia – albeit at a more relaxed pace. On the water, a sea kayak is one of the most intimate ways to experience the pristine environments at either end of the Earth and several operators now offer this. Pitching a tent for one night ashore on the Antarctic continent is another way to get a taste of the privations endured a century ago. Captain Scott died in his tent, but you won’t. So, if you have a hankering for something outside your comfort zone, quiz your agent about the tough stuff. You’ll never live it down! Aurora Expeditions 2009/2010 Antarctic season features thirteen expeditions on two ice-strengthened vessels that offer camping, kayaking, climbing and helicopter excursions, as well as unequalled wildlife viewing opportunities on the great white continent. In its ongoing quest to provide the most extraordinary adventures in Antarctica, Aurora Expeditions is offering thirteen itineraries for the 2009/2010 Antarctic season between November 2009 and March 2010, showcasing the beauty, remoteness, history and wildlife of the frozen south and offering the most comprehensive program of adventure activities of any Antarctic tour operator. Whether travellers want to see the tallest penguins in the world; paddle a kayak in clear waters dotted with icebergs; scuba dive in the remotest place on earth, or follow in the footsteps of the great explorers, Aurora has an expedition that will match their wildest dreams. Aurora’s 54 passenger ice-strengthened ship Polar Pioneer will undertake ten voyages to the Antarctic Peninsula during the season; while the 100 passenger ice-strengthened and helicopter equipped Marina Svetaeva will make three voyages to ‘Deep Antarctica’ including Commonwealth Bay and the Ross Sea. While not luxury vessels, both ships provide simple, comfortable accommodation with meals prepared by Western chefs. All voyages include all meals on board, shore excursions, and an in-depth education program with expert commentary and talks by Aurora’s team of naturalists, historians, geologists, expedition staff and special guest lecturers. The small group size makes it possible for all passengers to go ashore at every landing, allows the wildlife to be observed without disturbance and makes for more relaxed visits to historic sites and scientific stations. The maneuverability of these smaller vessels, along with a fleet of inflatable Zodiacs, allows travellers to visit places conventional ships cannot reach. Unlike some other operators, Aurora is not concerned with hairdryers, bathrobes, spa treatments, dress codes or room service – the emphasis of its expeditions are on true exploration and discovery in some of the most extreme wildernesses on the planet. The Antarctic Peninsula is the warmest and most accessible region of the frozen continent, reached by two days sailing from Ushuaia at the southernmost tip of Argentina. In addition to witnessing the most amazing wildlife spectacle on earth, for intrepid travellers, Aurora offers adventure options in the Antarctic Peninsula such as sea-kayaking, camping overnight on the ice, climbing and scuba diving. The 12-day ‘Antarctic Peninsula for Climbers and Kayakers’ (7 -18 December 2009) voyage offers the chance to climb icebergs and unclimbed peaks or paddle in pristine waters led by some of the world’s most experienced mountain climbers and guides. The 12-day ‘Across the Circle’ (16 – 27 February 2010) voyage includes the opportunity to scuba dive amongst glaciers and gigantic icebergs and meet seals and penguins in their element in a once-in-a-lifetime underwater adventure. The 20-day ‘Shackleton Odyssey’, (27 February – 18 March 2010) voyage retraces the epic journey of the great explorer Sir Ernest Shackleton and offers the option for experienced climbers to repeat his alpine crossing on foot from King Haakon Bay to the now deserted whaling station at Stromness. Voyages will also visit scientific bases and historic sites. Prices for Antarctic Peninsula voyages start at US$5990 (ex-Ushuaia) per person triple share. ‘Deep Antarctica’, the most southerly region accessible by ship, stretches from the Ross Ice Shelf to Commonwealth Bay in East Antarctica. It’s a wild place guarded by pack ice and is reached four days sailing across the Southern Ocean from Australia or New Zealand. This area is the stuff of polar legend, with century-old huts and base camps that are literally frozen in time. Voyages also plan to call in at two or three sub-Antarctic islands – home to millions of royal, king and other penguin species, several species of albatross, snorting elephant seals and frisky fur seals. The 27-day ‘Mawson’s Antarctica’ (11 December 2009 – 6 January 2010) voyage to Commonwealth Bay departs from Hobart, visiting the wildlife-rich sub-Antarctic islands on route to Cape Denison, site of Mawson’s historic hut, and the French Antarctic base, Dumont D’Urville. The two 26-day ‘Ross Sea Explorer’ expeditions will depart from Hobart (7 January – 1 February 2010, returning to Bluff New Zealand) and Bluff, New Zealand (2 February – 27 February 2010, returning to Hobart). These expeditions aim to sail to the Ross Ice Shelf, dry valleys, and historic huts of explorers Scott and Shackleton. Helicopter excursions are included on all voyages to Deep Antarctica. Prices for all three voyages start at US$12,590 per person quad share. Although suitable for people of all ages and physical abilities, these are not ordinary cruises. Weather and ice, not clocks and calendars, set the schedule for a journey here. In the spirit of exploration, landings and activities will depend on ice, sea and weather conditions and the daily schedule may change in line with the dynamic environment. Aurora Expeditions is a licensed travel agent who can arrange competitive airfares and pre and post touring options in conjunction with these voyages. cost of your flight to Ushuaia, South America to join the cruise. special offer/s available at this time. Early Booking offer for specific Antarctic Expeditions during the 2009-2010 season. in a first class hotel with breakfast, in either Buenos Aires or Santiago en-route to Ushuaia to join your cruise of choice. departing from Ushuaia prior to joining your cruise. Times are hard, but we must resist the temptation to stay at home, pull up the drawbridge and look after number one. The economic crisis, this time around, is global. And to understand it we need, more than ever, to keep in touch with the rest of the world, to see how others are coping and hopefully to learn something along the way. And let’s face it, you wouldn’t be logging onto this website if you didn’t feel, like me, that the urge to travel is not a tap that can be switched on and off at will. It’s a persistent, niggling feeling, fed by curiosity and, hopefully by concern as well. Those of you who caught Around The World In Twenty Years, our BBC One documentary at Christmas, will have seen the joy and pleasure on all our faces when I showed the old Eighty Days DVD to some of the dhow crew we tracked down in North-East India. I was as moved as they were. Despite being able to share very little of each other’s language, the re-union showed that it’s worth reaching out, and that the effort to re-connect can be reciprocated. It wasn’t life-changing for either side, but the shared laughter and the enjoyment of our differences made me feel happy and safe, several thousand miles from home. On that same journey we came very close to seeing the other side of the coin. Only three weeks after we’d filmed in the Taj Hotel and Leopold’s Bar in Mumbai, those who prefer to live by hatred and division had turned both places into killing grounds. And it’s no coincidence that the Taj Hotel and Leopold’s were both places in which people from all over the world came together to meet and talk. This, it seems was the very reason they were targeted. For those with closed minds, places like these represent an intolerable threat to their own malign sense of certainty. The attacks in Mumbai, and anywhere else in the world where people are prepared to kill rather than listen, are as clear a reason as there ever need be to keep meeting, talking, travelling and connecting. As for me, well, I’ve no great projects in the pipeline right now. Much of the year ahead will be spent getting Diaries Volume Two 1980 -1988, the Film Years (working title) together. It’s due to be published in September, and I’ve no doubt it will send me on some promotional travels come the autumn. But I haven’t stopped buying maps or cancelled my subscriptions to Geographical, Geo or The National Geographic magazine. Nor have I stopped reading the wise and wonderful experiences of the Polish writer Ryszard Kapuscinski. His latest, “Travels With Herodotus” has so much wit and wisdom, and he tells a darned good story too. Check him out. And check out a slim, evocative volume called Traveller by Michael Katakis (published by Burton & Park of San Francisco). I wrote the introduction because Michael represents all the best things about travelling. He listens, he learns, he writes about his love of the world simply, clearly and with feeling. And he loves eating ! Happy travels. See you on the road. As Scotland urges Australians to walk in the footsteps of their ancestors at ‘Homecoming’ in 2009, North East England also gives Australians the opportunity to learn more about their past; and some may find stories of tragedy and treachery. Within the borders of North East England and Scotland lie many stories of Australian heritage and ancient family connection. The Border Reivers, who many Australians’ surnames are linked to, ruled North East England and created chaos across the North East England and Scottish border. The Reivers were made up of Scottish and English clans and families, who as a result of their geographical position, were constantly subjected to violence associated with the various armies passing through the townships during the war between England and Scotland in the 13th – 17th Century. The Reivers (robbers) were known to have a strong allegiance to their family rather than to their country, and their craft at defending and raiding became so notorious the hierarchy in both England and Scotland employed them as a first line of defense against invaders. Many Australians can trace back their family history to that of the Border Reivers. Popular names such as Armstrong, Davidson, Gilchrist, Collingwood, Cranston, Young and Scott, can be traced back to the Reivers’ clans. A popular route taken by travelers to Britain is the Newcastle to Edinburgh track, which sees visitors leave Newcastle, travel throughout North East England and cross the border into Scotland. Travelers pass through the beautiful Northumberland district, visiting the historic Alnwick Castle, known for its role in the Harry Potter films; and north to the Holy Island of Lindisfarne, famous for its Christian links and Lindisfarne Mead. Further north, the border town of Berwick-upon-Tweed offers travelers a unique travel experience, where locals are sometimes English and sometimes Scottish. Bisected by the great River Tweed the historic town is scattered with local farmers markets and local arts and theatre performances. “With Homecoming in 2009, taking the route through North East England into Scotland is the perfect opportunity for Australians to discover their past, explore the beautiful scenery of two wonderful countries and learn about the historic border battles of centuries past,” said Kim Heaselden, International Brand Manager of One North East. The areas of North East England and Scotland are steeped in history that can be explored when visiting the region. North East England is home to the largest number of castles in the UK, with many of the castles remaining in the hands of the descendents of their original owners. Aussies can check to see if their family name was associated with this synonymous time in British history and even find a castle or its remains that was partially occupied or used by their ancestors by visiting www.BorderReivers.co.uk. To take it a step further and visit the towns in which the Border Reivers lived, visit www.northeastengland.com.au to find suggested travel itineraries and accommodation packages available in North East England. Travelling with an eco-conscience is easy in Queensland with its myriad of tours and hotels doing their bit to help save the fragile natural surrounds writes Jessica Reid. Flying into the tiny north-western regional hub of Wynyard, you could easily imagine you are in the middle of nowhere – and that is why so many visitors come! An easy 20 kilometre coastal drive from the working town of Burnie and a further 50 kilometres to Tasmania’s third largest city and Spirit of Tasmania ferry port, Devonport, Wynyard is perfectly placed to springboard nature lovers into the world-famous wilderness areas along the north and west coasts. Before heading off into the wild, swing by Burnie and see why it is shaking off the outdated industrial character that has defined it for so long. At the Lactos Cheese Tasting and Sales Centre you can sample fine cheeses, including major brands Tasmanian Heritage, Mersey Valley and Australian Gold. 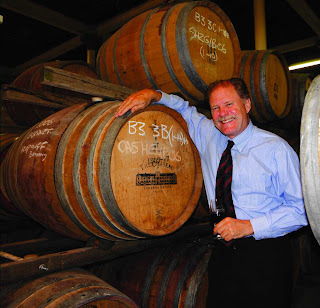 Premium food produce is fast becoming a Tasmanian specialty and you’ll find Australia’s largest single malt whisky distillery in Burnie. Hellyers Road Distillery makes fine, single malt whisky distilled from Tasmanian grown malted barley and famously pure Tasmanian rainwater. The distillery also produces the Southern Lights brand premium grain vodka. If you’re visiting in winter, this stop-off is almost mandatory. Eventually the lure of the renowned Tasmanian wilderness will beckon you but the “clarion call” will come from many directions. Most will yield to the irresistible allure of the UNESCO World Heritage Cradle Mountain Lake St Clair National Park, a mere 70 kilometres drive. From the swank Voyages Cradle Mountain Lodge to modest hiking cabins, the options are plentiful. The raw appeal of the Tasmanian mountainscape has captured the imagination of visitors for decades and none more so than pioneering outdoorsman, Austrian-born Gustav Weindorfer, who built a rough chalet next to the iconic Dove Lake in 1912. Weindorfer is revered as the “founder” of Cradle Mountain wilderness recreation and is fondly remembered as an eccentric, idealistic yet jovial man who would host guests with generous lashings of his garlic and badger (wombat) stew. “A mixture that would kill me in five minutes,” recalled local Bill Perkins in a eulogy to the colourful Austrian in 1982. Perkins first met Weindorfer in 1930, just before his death. Today you can see an authentic replica of Weindorfer’s cottage and outbuildings and get a feel for how people enjoyed the country almost one hundred years ago. If you do nothing else, be sure to complete the Dove Lake circuit, a relaxed two hour dawdle around this imposing feature that is one of Australia’s most instantly recognisable vistas next to Uluru and Sydney’s Harbour Bridge. If you really want to earn your “Wild Tasmania” badge, head north west from Wynyard into the Tarkine Forest region (the largest temperate rainforest in Australia) and plot a circuit via Stanley, Smithton, Corinna, Zeehan and Strahan. Get lost in the oblivion of true wilderness, a commodity that is fast disappearing in our shrinking, globalised world. The intriguingly-named Dismal Swamp is a natural blackwood forest sinkhole, believed to be the only one of its kind in the world. Thirty minutes (40km) south west of Smithton, the visitors’ centre showcases Tasmanian specialty timbers with a contemporary interior crafted from blackwood and Tasmanian oak. From there the walkway descends to the floor of the sinkhole, or if you’re game take the exhilarating 110m slide from the viewing platform to the swamp floor. There’s an electric buggy option too. Proclaimed by Bass and Flinders in 1798, historic Stanley is a delightfully sleepy hamlet distinguished by its characteristic, 150m high “nut”, a long extinct volcanic plug that forms an imposing natural citadel overlooking the town. Take the chairlift or walk to the top for panoramic views of Bass Strait. The nearby Highfield Historic Site epitomises the optimistic early settlement and is the site of land granted to the Van Diemens Land Company (VDL) in 1824. The homestead is a rare example of the elegant Regency period. 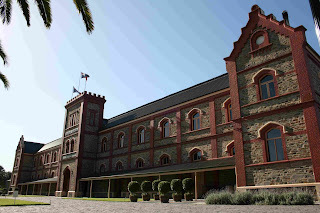 Edward Curr, the chief agent of the VDL, started construction in 1832, and later additions were made by John Lee Archer, the colony's first important architect. The harsh life reaped a toll on the residents, particularly the convict labourers and there are many stories of ghosts still wandering the dark corridors including that of Curr’s infant daughter killed in an accident. She has been known to tug on the skirts of women visiting the property. If you dare, take the popular night-time ghost tour. From Smithton, it’s a two hour drive to the remote village of Corinna, a former gold mining town settled in 1881. Today the entire village is a self-catering, eco-wilderness experience with authentic miner’s cottage accommodation, a totally refurbished hotel and river cruises aboard Arcadia II, a magnificent Huon pine river vessel. Kayaking, walking, fishing, bird watching and nature experiences are some of the activities available to guests. A further 100 kilometres via Zeehan is Strahan, a once thriving lumber town, now a picturesque bayside site overlooking gorgeous Macquarie Harbour. Before Strahan, there was Sarah Island located within the harbour and reputably the worst penal colony in the land. The ruins are still there and "is remembered only as a place of degradation, depravity and woe." (Rev. John West, anti-transportation activist and publisher, 1842). Local historian and author, Richard Davey, conducts semi-theatrical lamplight tours of the island and he almost channels the spirits of the long-dead convicts as you survey the scattered brickwork that once served as shelter for the wretched men. He’ll tell you glee the tale of the men who escaped from the island and turned cannibal and those who seized a boat they built themselves and were eventually arrested in South America. Complete your experience with a day cruise on the harbour and into the now legendary Gordon River or take the historic steam train to Queenstown, one of the most significant such journeys in the country. Cruise West, the global leader in small-ship exploration voyages and the largest American-owned cruise line, is extending the Alaska early booking discount and waiving the fuel surcharge for guests who book and pay in full by January 30, 2009. In addition, to encourage new guests to book any Cruise West itinerary, the company is waiving the fuel surcharge on all 2009 cruise itineraries for guests who pay in full by the final early booking discount date. Guests can save up to $690 for a 24-night cruise, based on double occupancy, with the fuel surcharge promotion. Cruise West guests can combine this value with early booking incentives to save additional dollars. By booking and paying in full on new or existing reservations by January 30, 2009 guests can save up to $1,210 per cabin, double occupancy, on a 2009 eight-night/nine-day Alaska’s Inside Passage cruise, including one-night hotel accommodations in Juneau. This savings reflects both the early booking discount and waived fuel surcharge promotion. The Alaska Inside Passage itinerary starts at $3,999 per person, based on double occupancy. Alaska cruises range from three-night/four-day to 24-night/25-day and start at $1,149 per person before savings are applied. This promotion may be applied to existing bookings. The fuel surcharge will be waived on all Cruise West itineraries that depart in 2009. Guests must pay in full by the final early booking discount date of January 17, 2009 for fall Japan; February 6, 2009 for Grand Asia, and Vietnam; and March 27, 2009 for Panama & Costa Rica, Mexico’s Sea of Cortés, Columbia & Snake Rivers, and British Columbia to have the fuel surcharge waived and receive maximum early booking discounts of up to $2,310 per cabin for Grand Asia, double occupancy. To view all of Cruise West’s itinerary options or to book a Cruise West cruise, call 1-800-689-1783 or visit http://www.cruisewest.com/. All Cruise West voyages offer authentic, life-changing journeys and pricing includes an excursion in every port, transportation to/from the airport, as well as the line’s signature Exploration Leaders who share insightful information on the flora, fauna, culture and history of the region. As always, gratuities are neither expected nor required onboard. Cruise West offers the opportunity to explore remote and distinctive destinations throughout North and Central America, Asia, South Pacific and Europe. Small-ship cruising allows for personalized experiences not offered by larger cruise lines. Guest capacities aboard Cruise West’s nine ships range from 78-138. Guests may expect personal enrichment through insightful shore programs, onboard narrative and presentations by local experts from a wide variety of backgrounds. In addition, destination specific materials and an array of books are provided in the onboard library on every vessel. Cruise West considers it a privilege to access some of the world’s most pristine wilderness areas and culturally rich countries. With this in mind, Cruise West views itself as good stewards and encourages crew and guests to act responsibly with respect to the environment and diverse cultures visited. It's hard not to be swept off your feet by Lord Howe Island. After two hours of flying over featureless blue, suddenly there it is, an oasis of natural beauty: the twin peaks of Mt Lidgbird and Mt Gower that dominate the island's southern end; isolated northern beaches populated by hundreds of thousands of seabirds and accessible only by sea kayak or on foot; a settlement of 350 locals and just 400 visitors; and a long, blue lagoon bounded by the most southerly coral reef in the world. Even David Attenborough once wrote that it is "so extraordinary it is almost unbelievable ... Few islands, surely, can be so accessible, so remarkable, yet so unspoilt." But Lord Howe is not just a pretty face. Because of its isolation, the island is an important site for in situ conservation of many rare and endemic species - almost half its 241 native plant species are found nowhere else in the world; the same goes for both the island's reptiles, a skink and a gecko, and almost a thousand insect species. 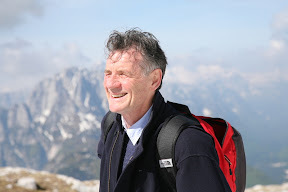 According to Ian Hutton, Lord Howe's resident naturalist and author of 10 books about the island (he was also awarded an Order of Australia medal in 2006 for his contribution to conservation and tourism), "People talk about the Galapagos Islands because of Darwin's connection, but there's more diversity on Lord Howe Island and it's so intact - the island is very much as it was when it was first discovered." Within an hour of arriving, we'd "rented" (by leaving a donation in the honesty box) masks, snorkels and fins at Ned's Beach and were communing with the fishes. The water was tropically warm, the visibility an astonishing 25 metres. Stepping off the beach, we entered a world of butterfly fish and rainbow-coloured wrasse, green turtles and blacktipped reef sharks, stingrays, clownfish, giant clams, corals and 14 kinds of sea. urchin. It was like snorkelling through an aquarium. And no wonder: the warm East Australian Current that swirls down the Australian coast flows out to Lord Howe too, where it meets cold southern currents, bringing together more than 500 fish species and 90 different corals. This array of tropical and temperate marine creatures is protected within the Lord Howe Island Marine Park. Lord Howe is also the best place in Australia to watch seabirds. Almost 170 species have been recorded living on or visiting the island group, and hundreds of thousands of seabirds nest there every year. Between September and March, just by standing on the beach at dusk you can witness a spectacular show: hundreds of muttonbirds skidding ashore then dashing through the palm forest to their burrows. The day we went birdwatching with Ian Hutton at North Bay, we walked past sooty terns sitting silently on their nests just metres from our sandy feet, then entered a dark forest of Norfolk pines where, looking up into the branches, we saw dozens of nesting black noddies, some within easy reach of human hands. All the birds seemed supremely unbothered by us. "That's one of the really special things about seabirds on Lord Howe Island," Hutton told us. "The birds have been on this predator-free island for millions of years, so they don't see us as anything but another bit of nature." It's tempting, when you find a place like Lord Howe, to wonder: what would it be like to live here? It seems so idyllic. There's no mobile phone coverage and no litter - the morning after the 25h World Heritage anniversary concert, the only sign that a few hundred people had been partying on the grass at Ned's Beach was a couple of pairs of thongs, waiting for their owners to return. There's also no crime: no room keys, no bike locks and you can leave your belongings safely on the beach while you swim. The locals are friendly too; it's easy to get used to complete strangers waving as you walk or ride by on the island's quiet roads. It's also something of an eco-community. Green living isn't just a nice idea on Lord Howe; it's part of daily life. The island locals are dedicated to conserving water (supply is rainfall-dependent) and energy (electricity comes from a diesel-powered generator with fuel transported in steel containers to reduce the risk of a spill). You can go a whole day without seeing a car, or needing one; even local businesspeople get around on bicycles. And transport back to your lodge is included when you dine at any of the island's fine restaurants. Then there's the recycling system. Every public garbage bin on the island includes a section for food scraps as well as one for recyclables. All the island's organic waste - from homes, restaurants and public bins - plus sewage sludge, and paper and cardboard that has been shredded, go into a Vertical Composting Unit which creates compost that residents use on their gardens. It's the first time such a system has been used in an isolated community with World Heritage status. Recyclable plastics, aluminium and glass are taken off the island and sold, which helps pay for the freight. Plastics and other nonrecyclables are compacted and shipped to a rubbish tip on the mainland. There's a userpays system to discourage dumping of household junk such as TV sets and old bicycles. And to encourage re-use of containers there's a Co-op store that stocks food and cleaning products. It's sponsored by the Lord Howe Island Board - the island equivalent of a local council - which reports directly to the NSW Minister for Climate Change, Environment and Water. Lord Howe also leads the world in the eradication of noxious weeds and feral animals. The Board conducts compulsory inspections of people's properties with the goal of ridding the island of noxious weeds. Teams of six to 12 "weeders" go up into the mountains and hills every day to remove cherry guava, the worst weed on the island. Thanks to $1.8 million in federal funding, in the last two years, 600,000 cherry guava trees have been removed. Asparagus fern, another voracious weed, is targeted by the island's popular Weeding Ecotours. Since 1999, there have been no feral pigs, goats or cats on the island either, so species such as the Lord Howe island woodhen, one of the rarest birds in the world, have been able to make a comeback from the brink of extinction. The Lord Howe Island phasmid, the world's largest stick insect, is also on its way back. Since its rediscovery in 2001, it has been in a captive breeding program at Melbourne Zoo and will be reintroduced to Lord Howe when rats are eradicated, sometime in the next few years. On our last day we climbed Mt Gower (875m), the "Everest of Lord Howe", to experience the island's ruggedness first hand. With much of the track unmarked and sections so steep that fixed ropes have been put in to help you climb up (and down) it's no wonder the walk takes a solid eight hours. But it's worth it. At the top, we were rewarded with views of Ball's Pyramid, a volcanic sea stack which rises eerily from the sea mist 23 km away, and cool cloud forest - Lord Howe is one of only a handful of islands in the world to have a true cloud forest. It's a miniature fairy glen of mosses, ferns and epiphytes, the kind of place Gollum from The Lord of the Rings might inhabit. That evening, back .at sea level, I stepped outside to savour the night air and the stars. Oh, the stars! The island is so far from any city that the night was star-spangled like a desert sky. As if I needed another reason to love Lord Howe. Getting there: Lord Howe Island is 700km north-east of Sydney. QantasLink flies daily from Sydney and Brisbane (www.qantas.com.au). Where to stay: Earl's Anchorage is one of the greenest accommodation options on the island. Its sustainable design ideas are based on lightweight construction and energy efficiency; there's solar hot water, with excess electricity stored in a battery bank, and greywater is treated and recycled on site (02 6563 2029, www.earlsanchorage.com.au). Pinetrees is the oldest and most central guest house (02 6563 2177, www.pinetrees.com.au). At the luxury end of the spectrum there's Arajilla (02 6563 2002, www.arajilla.com.au) and Capella Lodge (02 9918 4355, www.lordhowe.com). Camping is not permitted. • Go swimming, snorkelling or sea kayaking, or take a sunset cruise on the lagoon with Islander Cruises (02 6563 2021) and Howea Divers (02 6563 2290 or visit www.howeadivers.com.au). • Feed the fish at Ned's Beach; BYO stale bread, wade in up to your knees and hand-feed dozens of metre-long kingfish, wrasse, silver drummer and various other species. • Explore the island's 11 beautiful beaches, all easy biking distance from town. Ned's Beach was voted Australia's Cleanest Beach in 2004. • Go birdwatching with Ian Hutton: visit www.lordhowe-tours.com.au. For a calendar of mating and nesting seasons for a number of bird species, see www.lordhoweisland.info. • Walk one of the island's many trails. Pick up a copy of A Rambler's Guide to Lord Howe Island for $10 from the museum. • Climb Mt Gower (access is with a licensed guide only). Contact Sea to Summit Expeditions (02 6563 2218, www.lordhoweisland.info/services/sea.htmi) or Lord Howe Environmental Tours (02 6563 2214, www.lordhoweisland.info/services/environ.html). • Scuba dive more than 50 world-class sites, including Ball's Pyramid, with Islander Cruises and Howea Divers (see above). • Lord Howe Island Museum is open 9am-3pm Mon-Fri, loam-2pm weekends; public talks 5.30pm on Sunday, Monday, Thursday and Friday. On 17 December 2007, the Lord Howe Island Group - comprising Lord Howe Island, Ball's Pyramid, the Admiralty Islands, Mutton Bird Island and surrounding coral reefs - celebrated 25 years of being World Heritage listed. Weeding Ecotours run from June to August, removing asparagus ferns in the mornings with afternoons free to explore the island. 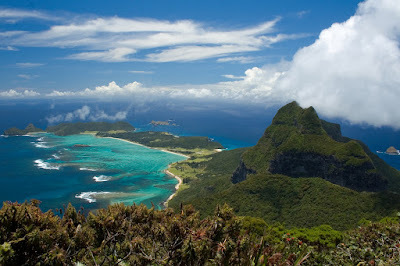 Visit www.lordhowe-tours.com.au for more information. The Rowley Shoals, situated 260km from Broome, off the north-west coast of Western Australia, are a true haven of natural beauty. Especially loved by divers, the Shoals are made up of 3 coral atolls - Clerke Reef, Mermaid Reef and Imperieuse Reef - with shallow lagoons filled with an abundance of marine life and spectacular coral. Each atoll that makes up the Rowley Shoals is approximately 80 - 90 square kilometres in area, and very similar is size, shape and distance apart. The Rowley Shoals were named in 1818 by Captain Philip Parker King, who first described their relative positions. He named the most north-easterly of the trio Mermaid Reef, after his ship. The middle shoal was named Clerke Reef after Captain Clerke, who had reported it from a whaler sometime between 1800 and 1809, and the south-western shoal was dubbed Imperieuse Reef after the ship from which Captain Rowley sighted it in 1800. The Shoals are now considered one of the very best pristine marine environments in the world. With their remoteness, lying on the very edge of the Australian continental shelf, many claim they are the most perfect example of shelf atolls in Australian waters. The coral gardens of the Rowley Shoals are absolutely beautiful and almost untouched by man. You can dive the area and hand feed the potato cod and maori wrasse, and the colourful reef fish don’t seem to be disturbed by the presence of divers. As the tides go down, the sea gushes over the edges of the shoals like miniature waterfalls, and the reefs disappear below the water’s surface at high tide, with only the Clerke and Imperieuse island’s sandy beaches showing. A visit to the “Acquarium” is an essential for the snorkeller. Rivalling the Great Barrier Reef, yet only waist-deep in water, the experience is amazing. It has brilliantly coloured corals, giant clams and more than 600 of the world’s most beautiful fish species at your fingertips! An underwater camera is a MUST! Another very popular dive experience is a “wall dive”, where you dive along the shoal walls as they are submerged in water. Outer reef snorkelling is amazing, as you explore the sheer coral walls. Clean and virtually undamaged by the effects of man and pollution, you’ll get to see just how spectacular the colours and shapes of the coral are. Your visit to this amazing place will be a memory that lasts for a lifetime. There’s very few spots like this left in the world nowdays, because of the ravages of mankind, so the Rowley Shoals should be high on your list of holiday destinations if you want an amazing experience. One you can tell your grandchildren about and still remember the beauty and colour of this spectacular location. Definitely one of Australia’s highlights. 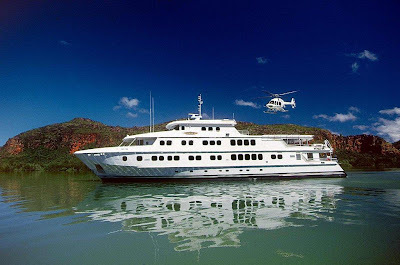 Since the Rowley Shoals are 12 hours off the coast of Broome, you’ll need a way to visit them, and there’s no better choice than the magnificent True North, operated by North Star Cruises. The True North allows discerning adventurers to experience the wilderness of the Rowley Shoals in surroundings more akin to one of the world’s most exclusive hotels! It even travels with a full-time helicopter - an air-conditioned Bell 407! Spend 6 days in absolute luxury aboard the True North, and experience the beauty of this magnificent location. We have plenty of diving trips for you to take, as well as delicious meals prepared by our master chefs. Relax in total comfort while our all-Australian crew attends to your every need. Willunga, Australia: This town in Australia is an hour’s drive towards the south of Adelaide. You will find the town in the McLaren Vale area and its specialty lies in the abundance of Shiraz and other red wines that taste heavenly. The limelight is taken away by Russell's Pizza - a local pizza parlor. The Willunga Farmers Market also offers fresh stuff and the beef found here tastes great, as the cows are grass fed only. Chapada Dos Veadeiros, Brazil: The 253-square-mile national park in Chapada dos Veadeiros is the ideal place to get refreshed. It gives you all the positive vibes and has a large concentration of natural quartz crystals that are considered to have magical powers. According to most Brazilians, this place has the highest concentrated energy than any other place in the world. The place also makes way for many interesting activities like hiking, swimming, bird watching and waterfall exploration. Graskop, South Africa: This South African town has a lovely mix of hip artists and traditional Afrikaner farmers. Anyone interested in traditional and contemporary African culture would like to visit this place. You can meet many African groups here and have a taste of their culture. The artistic scene here is colorful due to the recent inflow of Zulu, Shangaan, Swazi, and other African groups that have crept into this area since the end of apartheid. Weymouth, England: Sandy beaches, cobblestoned streets and Georgian homes of Weymouth run along the English Channel. All those who love this kind of an atmosphere should visit Weymouth for a memorable experience. Weymouth is also one of the best diving spots in the world with waters teeming with Roman shipwrecks, submarines from both world wars and the remains of a 16th-century Dutch sailing fleets. The charm of the English city is superb and it will give you that old English feeling. Gaziantep, Turkey: The food flavor is wonderful here. It may be normal to have just 4 spices in Turkish food in most parts of Turkey, but here they use at least 15 spices. Do not leave the place without tasting the food here. The dessert's main ingredient - pistachios, are found in abundance in the surrounding countryside. Today, you can circumnavigate the entire world within a day but it has not been like this always. Travelers of the earlier centuries had to get through some of the most difficult routes, encounter deadliest hazards and sail through deep ruffling waters to unknown destinations and that too without food and plagued with unknown diseases. Their unparalleled efforts and ruthless itineraries will continue to inspire and influence the world travelers for generations. Born on February 24, 1304, Abu Abdullah Muhammad Ibn Abdullah Al Lawati Al Tanji Ibn Battuta is known to be one of the most resilient travelers of the world. He was a Muslim Marinid scholar and jurisprudent from the Maliki Madhhab, a school of Sunni Islamic law. Being one of the gem explorers, Ibn Battuta had spend thirty years in traveling and has covered approximately 73000 miles. His journeys covered nearly the entirety of the known Islamic world and beyond, stretching from North Africa, West Africa, Southern Europe and Eastern Europe in the West, to the Middle East, Indian subcontinent, Central Asia and many more. He faced pirate attacks, muggings and hid in a swamp for a week without any food. His book "Journey" covering his experiences is one of the earliest accounts of the world in the 14th century. Being a Genoese navigator, colonizer and explorer, Christopher Columbus derives his popularity from some of the most fearless journeys ever made in the history of travel. He was born on 1451, May 20. His voyages across the Atlantic funded by Spain's Queen Isabella resulted in European awareness of the American continents in the Western Hemisphere. Columbus was the one who inducted widespread communication between the Europeans and the indigenous Americans. He is also known for building a settlement on the island of Hispaniola and for initiating the process of Spanish colonization of the "New World." His hardships included temporary blindness, arthritis, flu and even insomnia. Dom Vasco da Gama is known to be one of the most successful Portuguese explorers in the European Age of Discovery. He has also been the commander of the earliest ships sailing directly from Europe to India. It was 8th July 1497 when four ships along with a crew of about 170 men left Lisbon for India. In 1499, Vasco returned to Portugal where he was rewarded as the man who had succeeded to execute the plan of establishing trade relations with India. He was conferred the title "Admiral of the Indian Seas," and his feudal rights to Sines were confirmed. As a result, the spice trade emerged to be a major asset for the Portuguese economy. A trader and explorer from the Venetian Republic, Marco Polo born in 1254 gained worldwide fame for his grand travels. All his travels and contributions have been preserved in the book "The Million" or “The Travels of Marco Polo.” Marco Polo along with his father Niccolo and his uncle Maffeo is known to be one of the first Westerners to travel the Silk Road to China to visit Kublai Khan. Although the Polos were not the first to reach China overland but their trip was the best-documented journey of their time. Marco Polo's description of the Far East and its riches influenced Columbus to try to reach those lands by a western route. Doctor David Livingstone was a Scottish Congregationalist and the pioneer of medical missionary and African discovery. Born on 19 March 1813, Livingstone was the first to witness the Victoria Falls and this inspired him to give the English name in honor of his monarch, Queen Victoria. He can be undoubtedly claimed as one of the most popular national heroes of the late-nineteenth century of Victorian Britain. He has directed on a good number of interconnected levels as the Protestant missionary martyr, scientific investigator and explorer, imperial reformer, crusader against slavery and the advocate of commercial empire. The Grand Dad of all travelers – was the man responsible to usher the human spirit of looking beyond the horizon. Born in 1480, this Portuguese maritime explorer found a westward route to the Spice Islands of Indonesia and became the first person to lead an expedition across the Pacific Ocean. This was also the first successful attempt to circumnavigate the Earth in history. He was the first individual to cross all the meridians of the Globe, the first European to reach Philippines and his travels proved that the world was indeed round.